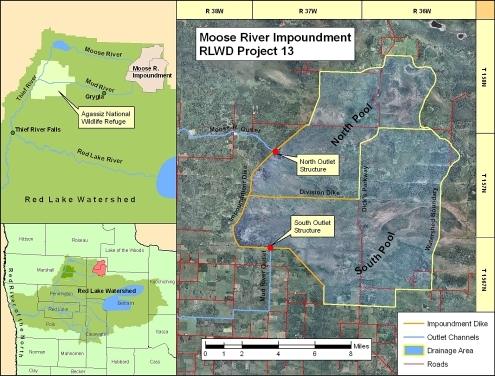 The Moose River Impoundment is located at the headwaters of the Moose and Mud Rivers in northwestern Beltrami County, about 15 miles northeast of Grygla, MN. The drainage area of this impoundment is approximately 125 square miles. This impoundment facility was designed primarily for flood control and wildlife management. A freeboard flood storage capacity of 54,500 acre-feet helps to reduce peak flows on the Thief and Red Lake Rivers during major runoff events, and enhances wildlife and associated recreational benefits at the site by retaining summer water in its north and south pools. Additional benefits include the ability to adjust and maintain normal downstream flows and to provide access to water for fire fighting. The North Pool flows into the Moose River (Judicial Ditch 21). The major components of the North Pool include 5 miles of diversion ditch, 4 miles of earthen dike (1218.0 msl), a gated outlet structure, and a rock-lined emergency spillway (1216.0 msl). Approximately one-third (41.7 sq. mi.) of the total project drainage area flows into the Moose River. The South Pool flows into the Mud River (Judicial Ditch 11). The major components of the South Pool include 3 miles of diversion ditch, 9 miles of earthen dike (1220.0 msl), 4 miles of earthen dike between the North and South Pools, a gated outlet structure, and two emergency spillways (both at 1218.0 msl). An inter-pool structure was also built into the Division Dike to pass water between the North and South Pools. Approximately two-thirds (83.3 sq. mi.) of the total project drainage area flows into the Mud River. JOR Engineering completed an Inspection Report for Project 13 in 2007. The general inspection included both the North and South Pools, the earthen embankments, two concrete outlet structures, a concrete structure connecting the two pools, and three emergency spillways. Some minor settlement has occured in various areas and the two outlet structures have fractured concrete at the junction of the respective head walls and weir walls. It is believed that this movement is cause by the freeze-thaw cycle. The inspection report recommends specific repair/maintenance procedures, and the required work will be completed in 2008.